Chef Felix Eppisser of the one-star Michelin and 16 points GaultMillau rated restaurant Spice in Zurich, Switzerland shares a few recipes, which illustrate why the restaurant is aptly named. Felix Eppisser is an award-winning chef whose career highlights include: being a member of the most successful Swiss National Cooking Team of all time, and winning many regional and international cooking competitions. He has worked at the Hotel Giardino in Ascona, at du Théatre in Bern, Hotel Savoy, Bauer au Lac, and Dolder Grand in Zurich, the Landhotel Hirschen in Obererlinscbach, and the Hirschen in Obermeilen. 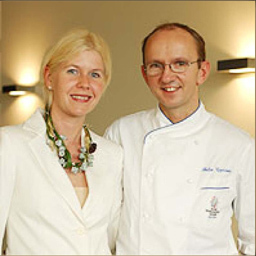 He also worked at the award-winning Guesthouse Bären in Nürendorf from 1997-2003, ranked as 37th on the Swiss Restaurant List, where he and his wife, Lucia, were elected as Hosts of the Year by Guide Bleu in 2002. I had dinner at Spice in October 2006 and had the opportunity to meet Chef Felix and Lucia, and take a tour of the kitchen. The restaurant opened in 2004 and since then has proved to be a true gem in the Zurich culinary scene. When not creating new recipes, he enjoys sports, and is a talented photographer. Heat peanut oil (not too hot), add the spices, and roast for a few seconds. Ribs of Lamb Method: Marinate the lamb ribs approximately 2-3 hours in the spicy herbal mix. Season with salt and pepper. Preheat oven to 140° C (285° F). Roast the lamb ribs gently in the peanut oil and cook until pink (54° C, 130° F). Cut baguette into pieces of 10 -12 cm (4 - 4.75 inches) in length. Do not use a baguette that is too thick. Cut the baguette in half and slightly hollow-out. Bake until crisp with mustard butter in the broiler or on the grill. Cover with the warm onion mousse and heat again under the broiler. Presentation: Arrange the meat on the baguette and serve with the chutney. Add lamb or veal juice. Preparation: Roast the mustard seeds in peanut oil (be careful); add the other herbs and onions. Add the tomato slices, crude sugar, and coco vinegar. Heat mixture and let simmer. Add blanched raisins and season to taste. Note: If possible, prepare 2-3 days in advance to balance the flavors. Preparation: Heat milk and vanilla bean together with sugar until the mixture is slightly reduced. Dissolve the gelatin in warm milk, stir, and let cool for a few minutes, pour into fancy glasses and let cool thoroughly. Preparation: Make a creamy ice cream, (see recipe above), add the melted chocolate, blend everything, and let cool. Fill Paco Jet cups and freeze, (or freeze in an ice cream maker). Preparation: Whip egg whites and powdered sugar to form a meringue. Mix curry powder and flour and sift, carefully mix with the rest of the ingredients. Shape and place on baking sheets, and bake in preheated oven at 220° C (425° F). Remove from oven, freeze for a few minutes, cut the biscotti, and bake again at 140° C (300° F) until the biscotti are golden. 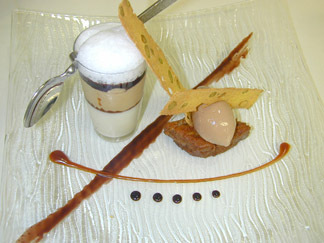 Presentation: In a tall glass, alternatively layer the caramel, chocolate, and the Latte Cotta. Finish with milk foam. Decorate with curry biscotti and Maracaibo, and Espresso ice cream. Read the article on the restaurant Spice in the Restaurants section. Read other articles on Switzerland in the Destinations, Hotels and Resorts, Restaurants, Chefs' Recipes, Spas, Liquor Cabinet, Wine Cellar, Gastronomy, Luxury Products, and Adventures sections. For information on Switzerland, please visit: www.MySwitzerland.com. For information on Lucerne: www.Luzern.org. For information on Interlaken: www.InterlakenTourism.ch. For information on Bern: www.BernInfo.com. For information on Zurich: www.Zuerich.com. For information on Swiss International Air Lines: www.swiss.com. For information on the Swiss Pass: www.SwissTravelSystem.com. © March 2007. Luxury Experience. www.LuxuryExperience.com All rights reserved.